John Nost Sartorius, "Full Cry, detail"
Black and tan coloured terriers have existed in England for centuries, appearing in art dating as far back as the 16th century. From the earliest of times, Terriers seem to have existed in both rough and smooth form and black and tan was a predominant colour. 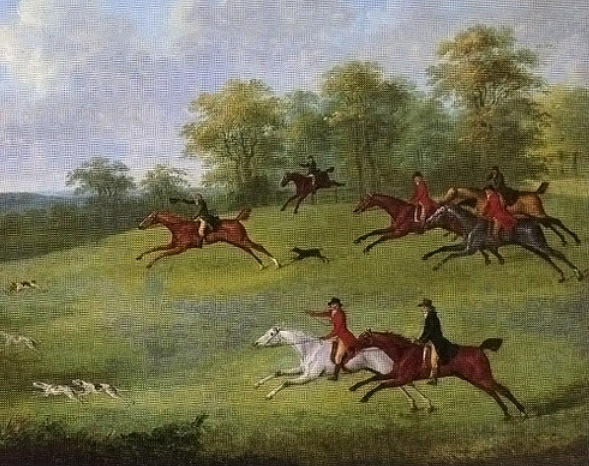 These dogs were both adept at hunting and killing vermin as well as accompanying Fox Hounds on the hunt, where they were tasked with routing the fox out of dense brush or underground dens. 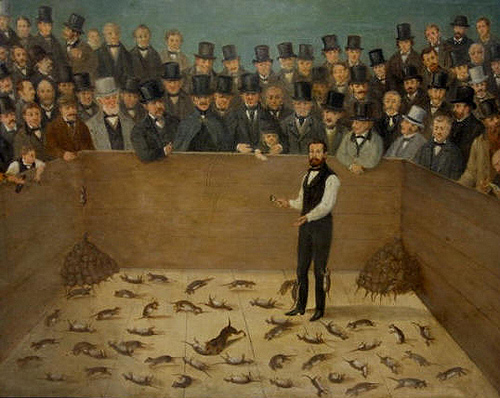 While smaller examples would have been carried by mounted hunters in specially designed pouches, period artwork seems to indicate larger specimens were capable of keeping up with the pack. From those original black and tan dogs descended many breeds of modern terrier, including the Manchester, but when and how the transformation took place is a matter of some debate. Originally bred as "ratting machines", black and tan terriers made frequent and highly acclaimed appearances in the rat pits where enthusiasts would bet on the number and speed at which they could kill vermin. During this era, most pit ratting dogs were interbred with the Bulldog to some extent as it was thought that this breed offered greater will to compete over long periods and tenacity to withstand painful rat bites. While these crosses undoubtedly led to the formation of the primitive Bull Terrier, because black and tans were "considered the essence of perfection" even among immediate descendants of this cross, there is little doubt that the black and tan descendants of these pit ratters should be credited for the Manchester's early roots as much as those maintained as "pure" during this period. One of the most famous black and tan competitors was a five pound bull and terrier cross appropriately named "Tiny," who is known to have killed 100 rats in the astonishing time of 5 1/2 minutes! During much of the early 19th century the breed was known interchangeably as the English Terrier, Old English Terrier and Black and Tan Terrier, with the latter taking precedence over time. English Terriers were divided by colour, being white or black and tan, and later by size. The English Toy Terrier gained popularity in the late-19th century and retains the old name to this day. 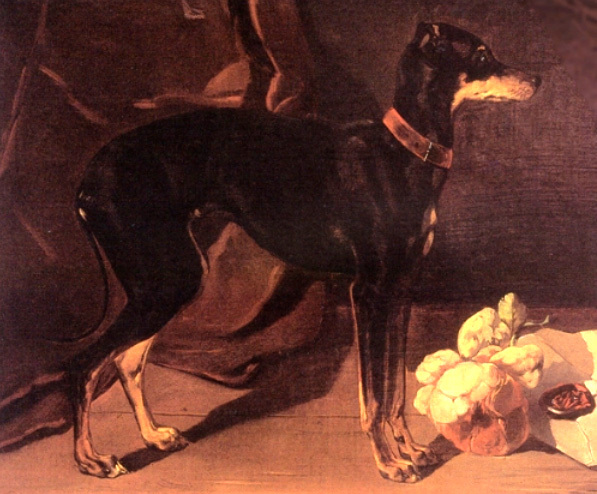 An engraving of Mr. Fitter's "Dandy" appearing in John Walsh's Dogs of the British Isles, depicts one of the most successful competitors at early dog shows. Though he had considerably more tan than modern Manchesters, his categorization as a Black and Tan Terrier is undeniable. In the 1850s or 1860s another important cross would inform the future of the breed as fanciers introduced some sort of small hound in order to further refine the breed. There is some debate as to whether this was achieved through introduction of the Greyhound, Whippet or Italian Greyhound, but it is likely that both the Whippet and the Italian Greyhound played some role. The immediate results of these crosses can be seen in Joseph Stevens' 1850 painting below as well as in descriptions of the "spider -terrier" who enjoyed a brief popularity among Victorian ladies. As a result of this cross, the breed became dual purposed, being equally adept at dealing with vermin and coursing small game. First mentions of the name "Manchester Terrier" emerged in the 1870s, much to the consternation of dog experts like Hugh Dalziel and John Walsh. 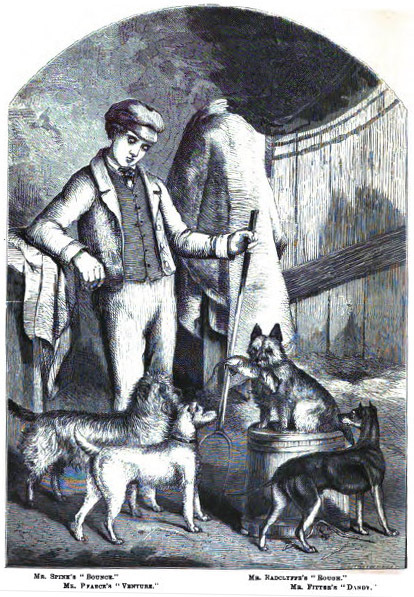 Though both men recognized the contributions of fanciers in the Manchester district of England, particularly of Mr. Samuel Handley whom they credited as one of the greatest exhibitors of black and tan terriers at early dog shows, they disagreed that the name of the breed should be changed. This debate is reflected in the stud books of the Kennel Club, which waffled between Black and Tan Terrier and Manchester Terrier until well into the 20th century before settling on the name by which we know the breed today. The decline and eventual banning of blood sports affected the Black and Tan Terrier greatly, as did the rise of the dog show. By the 1870s the breed was classified by several observers as "essentially a fancy dog" being bred entirely for such things as colour and markings. As early as the 1880s, prominent writer John Walsh ("Stonehenge")--who had praised the black and tan's usefulness only 20 years before--was decrying the emphasis on markings, remarking that "The colour (including markings) is regarded as more important than any other point by the breeders and fanciers of this terrier, to such an extent as to justify the allotment of 25 out of 100 in the scale of points. Of course, in any breed intended to be judged for its suitability to work, such an allotment would be absurd..." And by the 1890s writer Rawdon Lee concluded the modern Manchester to be unrecognisable as a black and tan terrier given it was wholly incapable of performing any of its original functions. The banning of ear cropping by the Kennel Club in 1898 further impacted the breed and by the early 1900s the Black and Tan Terrier's popularity was waning. The most prominent early Black and Tan Terrier fancier in North America was undoubtedly Mr. Fred C. McLean whose Willowdale Kennel dominated dog shows throughout the late-19th and early 20th century. A resident of Hull, Quebec, Mr. McLean was a founding member and first president of the Black and Tan Terrier Club of America, the very first club formed in support of the breed on this continent. Comprised almost entirely of Canadian fanciers of the day, the club was an active force during the early 20th century and offered a number of highly coveted prizes at prominent shows. In 1923 the Manchester Terrier Club of America was recognized, reflecting the breed's change of name. By 1934 the name of the Toy Black and Tan Terrier was changed to the Toy Manchester Terrier and in 1938 the American Toy Manchester Terrier Club was formed. The Second World War would deliver a heavy blow, however, and by the late-1950s the Manchester Terrier Club of America was defunct leaving the Standard Manchester Terrier without organized representation. With the Standard variety hitting a new low in popularity and the Toy Manchester suffering the ill effects of miniaturization, the American Kennel Club recommended that the two varieties combine. In 1958, the American Manchester Terrier Club was formed. The Canadian Kennel Club followed the American model insofar as the two breeds were combined into one with two varieties for registration purposes, however fanciers in this country objected to changes (most notably with regard to size restrictions) made in the breed standard adopted by the AKC soon after and elected to retain the breed standards previously in place. In 1998, almost 40 years later, the Canadian Manchester Terrier Club was formed.